Labs in the Science and Engineering Hall include an environmental engineering lab that houses equipment like a gas chromatograph and an atomic absorption spectrophotometer, according to the school's website. These types of instruments typically require large amounts of energy when in use, experts said. As officials embrace sustainability as a University-wide goal, experts said they could face one unexpected obstacle in reaching energy targets: research labs. Officials said the University is taking measures to make its research buildings more sustainable through energy-saving infrastructure and building features. But sustainability experts said science research labs often require equipment that uses enormous amounts of energy, a potential blow to efforts to reduce energy consumption. University spokesman Tim Pierce said crews try to offset energy use from labs with equipment like low-flow fixtures, occupancy sensors and efficient heating and cooling systems. Pierce said research labs often advance the cause of sustainability by exploring new approaches to decreasing energy use and water consumption. Older labs, like the engineering design lab in Tompkins Hall, are not LEED certified because they were built before the University established new design standards, he added. The University has prioritized both research and sustainability in recent years. New campus buildings were constructed to meet environmental standards and in 2015 GW began using solar power for half of its electricity. At the same time, increasing research – particularly in engineering and scientific fields – has become a major University goal as faculty have attracted more federal dollars to fund their projects. But experts said high-energy equipment – essential in many labs – could hamper the University’s efforts to trim its energy usage. Labs in the Science and Engineering Hall include an environmental engineering lab that houses equipment like a gas chromatograph, an atomic absorption spectrophotometer, incubator and various water testing equipment, according to the school’s website. These types of instruments typically require large amounts of energy when in use, experts said. Other labs like the fluid mechanics and hydraulics lab also include energy-intensive features. Sustainability experts said lab equipment like fume hoods and ventilation systems limit the presence of toxic chemicals in the air and can sometimes make sustainability efforts counterproductive. Nurit Katz, the chief sustainability officer at University of California, Los Angeles, said fume heads can use as much energy as two or three homes. Labs have to continuously circulate outside air to keep the space free of toxic gas, she said. Katz said sustainability officials at universities could implement systems that allow for fewer air changes. “It takes some collaboration between environment, health and safety, and energy teams, but it’s definitely possible to reduce some of that,” she said about the energy consumption. 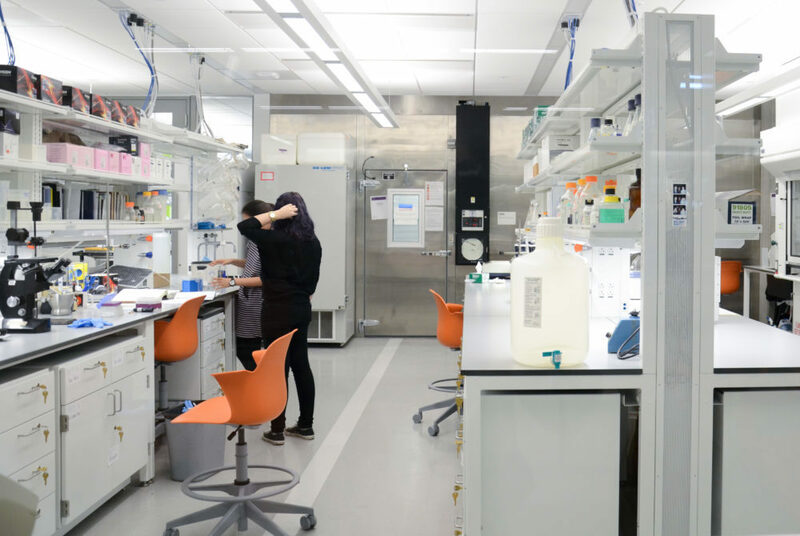 Katie Bergfeld, a program specialist at the Department of Energy and Environment, said GW has made strides in constructing environmentally friendly buildings, but audits and equipment upgrades can help reduce energy consumption in lab spaces. “One thing that we could recommend to any university is making sure that you’re updating your equipment, you’re doing audits, you’re doing regular checks on the equipment and the lighting and all systems in the building to make sure that they’re either performing where they should be performing or need to be replaced,” she said. SEH, which opened in 2015 with a $275 million price tag, is a LEED certified building, meeting international environmental standards like energy savings and low-water use. Charles Garris, a professor of mechanical and aerospace engineering in the School of Engineering and Applied Sciences, said SEH has several practices in place to make the building more sustainable, but some energy consumption is unavoidable. He said much of the high-powered equipment was installed to keep researchers safe. SEH has several sustainable efforts, including lighting with motion sensors, vegetation on the roof to convert carbon dioxide into oxygen and an outdoor reservoir to store rainwater, Garris said. “That’s very unique at GW and it has a substantial reduction in our carbon footprint,” he said. Sarah Chadwick and Meredith Roaten contributed reporting.